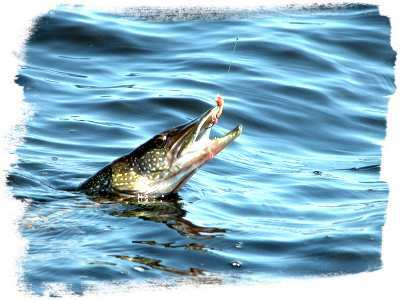 The large and popular northern pike (Esox lucius) is most common from the Great Lakes north to central Manitoba, though its range extends throughout much of North America. Northern's grow extremely fast - in the southern waters they may grow to over thirty inches in length in only three years. In northern waters their growth rate is slower, but by the end of their first year most pike are over fifteen inches in length. Pike spawn in the northern areas of their range at two years of age. A few of the faster-growing pike in the southern range may spawn after one year. In the spring, the pike move into the shallows at night and wait to spawn until the following afternoon when the waters have warmed to 50ºF.All members of the pike family do all of their feeding during the day. Spring, fall, and winter fishing seems to produce the most pike, but they can be caught in the summer. The fish seek cooler waters during the hot summer months, but they do continue to feed in hot weather. Pike do not swim in schools, but they do group together in prime weedy areas. Where one fish is sighted, there will likely be others in the same vicinity. Most pike are found in five to twenty feet of water, at the edges of dense weed beds, especially weed beds near sharp drop offs. Pike attack almost anything that looks like a potential meal - usually minnows and other small fish, but also ducklings and muskrats. Use medium or heavy bait casting equipment for these big-lure fish. Almost any lure attracts the attention of a voracious pike, but large spoons and plugs usually catch the biggest specimens. Where legal, bait an eight-inch live sucker hooked lightly under the back fin with a 3/0 hook on a twelve-inch wire leader. Hang the bait about five feet below a large bobber and add enough weight to keep the bait down. Lower the rig into the water, watch the bait swim for the weeds, then suspend the bait near the edge if the weed bed. When the pike strikes the bait, the bobber will be pulled underwater and held there while the pike turns the bait to swallow it headfirst. Try to set the hook before the pike swallows the bait - the hook placement at the back of the bait's fin ensures the fish will be well hooked even before it swallows the bait, and a swallowed bait harms smaller pike. When using heavy bait, use heavy bait casting equipment with twenty-pound test line. Summer pike fishing is also great with slowly worked artificial lures. With a sand or mud lake bottom, slowly drag a black or brown lead-head jig along a cool-water depression. Other slowly worked lures are the Mirrolures and Mepps Giant Killers. Most anglers have the best pike fishing experience in the spring and fall when the lake temperature cools. Look for fish in six to twelve feet deep flats with weeds and scattered brush. Cast a 3 or 4-inch red-and-white spoon (or a red-and-yellow spoon in lakes with yellow perch or walleye forage fish). On overcast days, use bright silver or gold spoons. For trolling and casting, use medium-weight bait casting gear with a fifteen-pound-test line and a twelve-inch wire leader. If the pike do not strike with the wire leader attached, remove it and try the lure again. When using a spoon lure, make sure the ball-bearing swivels are quality swivels that do not inhibit the spoon's action or twist the line. When fishing a spoon over submerged weed beds, let the lure drop just above the weeds (a 4-inch spoon falls at a rate of about 1 ft./sec) then quickly retrieve the spoon for a few seconds. Stop and let the lure flutter down near the weeds and drop the rod tip one or two feet towards the spoon. The spoon moves slightly backwards at this point, a movement that often triggers a strike from a following pike. Over sandy or muddy bottoms, let the spoon sink to the lake floor then hastily retrieve it for a few feet then let it sink to the bottom. Most strikes occur when the spoon is resting motionless on the bottom. Sometimes the pike are interested only in falling spoons. Use a jigging movement, pointing the rod at the spoon and quickly lifting the rod straight up and overhead. Immediately drop the rod again and reel in the slack line slowly. When the line is tight, quickly jerk the rod in an overhead position and repeat the process. Since the pike take the spoon as it is falling, the (firm) quick vertical lift on the rod will hook the fish. In weedy waters, try replacing the easily snagged treble hook with a single large hook that is easier to navigate through dense aquatic growth, and is easier to remove from a toothy pike's mouth. In the fall, the cold, windy days that signal changing seasons are excellent pike fishing days. Large groups of pike congregate on flats with bundles of weed growth in water five to ten feet deep. To find pike, use a systematic trolling pattern that covers the whole area. Troll about 20 feet behind the boat until the fish are found, then cast to the small area. When the pike are scattered in the weedy flats, trolling is the best method. A pike that is following a spoon will often strike when the boat makes a turn, or if the spoon makes a jerky motion. Make several passes over the same areas where pike are sighted or where they have struck the lure. Spoons are not the only trolling lures that catch big pike; plugs, large spinner baits, and sometimes streamer flies entice eager pike. Large spinner baits remain popular fall trolling lures. Try those with a large, single silver Willow-Leaf blade and a black buck tail body. Under windy conditions try using a yellow body, and in discoloured water use a basic black spinner bait. Use the same techniques for catching northern pike throughout their range from the U.S. rivers to the Canadian lakes. Fish the flats and weed beds from fall to spring and find the cooler bottom depressions in the summer months for big pike fishing all year long.